Ok, this is going to be more of a PSA than a review.... ok, actually it's going to be more of a wish list item then a PSA. See, I was busy toiling away with the breakfast sundae project when I realized I had never actually posted anything about the ice cream I was using. 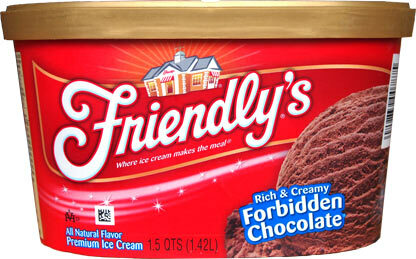 That's right, I've never mentioned Friendly's version of dark chocolate ice cream on the blog before. It's not new or anything, but now that the slower winter months are upon us, seems like a fine time to mention it. 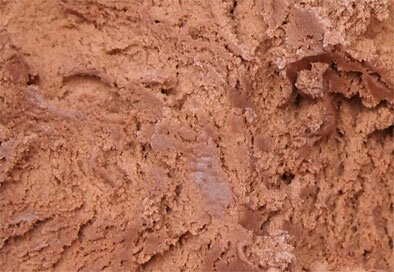 Friendly's makes a fine regular chocolate ice cream, so this is just it's slightly darker, slightly more dry cousin. It's nothing drastic, nothing that will scare you away, but it's distinctly different if you are looking for something to change up your regular sundaes. It's worthy of a purchase if you don't have access to any of the other dark chocolate flavors that we have reviewed. And my wish? 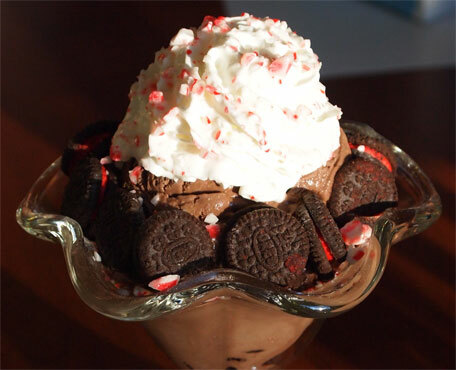 Well, when I was building this mini candy cane Oreo sundae, I stumbled upon something. The forbidden chocolate ice cream really makes the Oreos pop. I was really impressed with how well the two items played off each other, so here is my request. Can we get a Forbidden cookies & cream flavor? Or how about just a forbidden cookie flavor that uses wafers instead of the whole cookie? Mmmm, I can dream can't I? Aside from Friendly's Chocolate Marshmallow this is also one of my faves. Thanks for mentioning it and I love the sundae! We just finished up this flavor and made sundaes. Try it with broken up Pepperidge Farm mini-candy cane milano cookies. Very good! nice! I have a bag of those but havent opened them yet, hope I have enough of this ice cream left. This is actually my favorite supermarket chocolate ice cream, and I actually prefer it to the "super-premiums". It's just a great strong chocolate flavor without being too dark or rich. I soften the chocolate and then stir in mini-chocolate chips. Delicious. Forbidden Chocolate is my go-to ice cream... I keep it stocked at all times! I swear though, sometimes it at least appears more dark than others... dunno, maybe it's cosmetic... maybe I'm crazy. But, my real comment... everyone knows "chocolate chip cookie dough" ice cream. Everyone makes it. WHY HAS NO ONE MADE CHOCOLATE COOKIE DOUGH ICE CREAM!?! Like, chocolate (or preferable forbidden chocolate) ice cream, with cookie dough bites in it? Seriously... wtf... why is that not a thing? Or if I'm wrong, and it is a thing, why are you not giving me some right now, and when do you plan to get on that? it's not quite what you want, but have you tried The Tonight Dough? Those are the first two that come to mind. Wow, guess I missed the Friendly's attempt at it but it sounds like I didn't miss too much. It's surprising because I sometimes get Friendly's chocolate chip cookie dough and that typically has quite a bit of cookie dough in it. Guess I'll have to try eating Jimmy Fallon...... Not sure how I feel about that. Ahem. Seriously though I don't like too much stuff in my ice cream. If I'm putting something in it I like to add it myself (Ghirardelli 60% chips). That kind of looks like it's got a whole bunch of junk in it but if anyone does mixing well I'd say it's probably Ben & Jerry's. I found some Friendly's double chocolate chip cookie dough today! It's no longer Marked limited edition... Maybe they picked it up! Trying it tonight, with some forbidden chocolate and Vienna mocha chunk... DONT JUDGE ME! I had vegetables today. Try Friendlys Double Chocolate Chip Cookie Dough Ice Cream...it’s so freaking good! !